Which deck is better: UR Breach or UR Kiki-Jiki? Undoubtedly this is the question I received the most while playing this deck on Twitch. The decks are incredibly similar, both relying on Blood Moon and an A+B combo, but they do have different strengths and weaknesses. My write-up and video series with UR Breach can give you a little bit of a background on that archetype if you are interested, and here I’ll largely be focusing on the differences between the two similar archetypes. The largest advantage of the Breach deck lies within its combo. Aside from countermagic and specific discard, it can be difficult to interact with Through the Breach and even more difficult to interact with Emrakul, the Aeons Torn. Outside of tapping it with Cryptic Command (or hilariously enough a Pestermite) you are going to be “annihilated” for 6 and have to deal with 15 power coming your way. One weakness worth mentioning, however, is that 15 points is not always enough. Frequently Modern manabases will have already taken care of those first five points, and occasionally Snapcaster Mage teamed with Lightning Bolt can finish the job—but this will not always be the case. There will be close games with this deck where you attack with an Emrakul and lose anyway. Contrast this to the Kiki deck featured today. You will always win after a successful assembly of your combo, but how often will that occur? Your pieces are dramatically more fragile. Kiki-Jiki, Mirror Breaker is a 2/2. 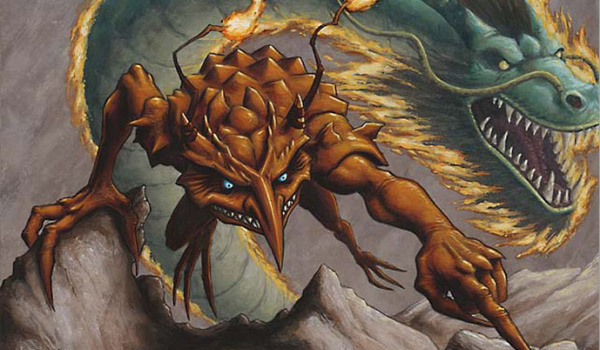 Pestermite is a three-mana 2/1 and Deceiver is a three-mana 1/4. Let that sink in; these pieces are not safe from Modern removal. One of your pieces (maybe two) will be soft to burn-based removal, and on top of that Path to Exile or a revolted Fatal Push are equally sufficient. Sometimes your opponent just doesn’t have it or you can set up a timely tap with a redundant Pestermite, but more often than not, removal will easily break up your combo. The strength in the UR Kiki deck lies within its plan B. Both decks have an underlying tempo plan built into the deck. Any deck with the ability to play Bolt, Snap Bolt, is going to be interested in going after their opponent’s life total in some portion of its games. Instead of having an uncastable 15/15 or a five-mana do-nothing sorcery, this deck has flying 2/1s with a relevant enter-the-battlefield trigger. It does still contain a somewhat poor five-mana value creature, but most importantly it is only occupying two slots rather than four. Add Vendilion Clique, Electrolyze, and the aforementioned Snapcasters the the mix, and you have a clear tempo-oriented plan. I’ve definitely had a good time with this deck thus far. While the advantages within each of the two archetypes are clear to me, I’m uncertain with archetype is better in the meta at large. I must admit at the very least I am swayed somewhat by the tempo argument within the Kiki deck; that kind of solid underlying secondary plan (arguably primary plan) is appealing to me. I discuss this a bit in the video content, but there are other avenues to explore with this archetype that remove Blood Moon and instead pursue a third color for something like Tarmogoyf, or Tasigur, the Golden Fang alongside Kolaghan’s Command. I have not tested this myself but it could very well be a solid way to develop the archetype. No love for Chandra, Torch of Defiance? She can ramp to 6 mana on turn 5 (that’s kiki+dispel), otherwise she is a removal or a pseudo draw or a shock. I think her mode are all relevant here. I can’t see downside. Chandra could definitely be something worth testing – likely in place of either or both of the sideboard Jaces. I’d consider putting her in main deck replacing her parents (quite flavorfull isnt’it?). Thanks for the video! I have to say that I can see how the ability to chip away at the opponent can make UR Kiki attractive, but the creatures are somewhat less impressive than I remember them being for Twin. The backup tempo plan looks playable but somewhat unexciting, which makes me think Breach may be the more attractive choice. Certainly they can be a little anemic, which is why they are your plan B, but they can often still get the job done. Breach may be better, but I’m still undecided. I’ve seen a similar version having some success recently, but it is running Spreading Seas and Torrential Gearhulk main. I think P & K is an easy switch for Gearhulk, since it seems pretty clunky, but how do you feel about Spreading Seas? Is it just too slow for what it does?